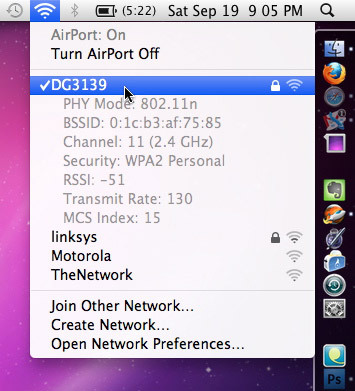 If you Option-Click the Airport Menu you can get extended information about the wireless network you are connected to (and the ones you’re not as well), including Channel information, MAC address of the access point, signal strength, and the transmission rate. This is Snow Leopard only, if you haven’t upgraded to Snow Leopard yet and your Mac is compatible, it’s highly recommended. Thanks to reader Jim Thorpe for the tip and screenshot! Works on Leopard too but you don’t get as much detailed information. Could you explain a bit more what they mean. My RSSI is -87 but my Transmit Rate is 30. What does that mean?